Albert Pujols’ outstanding Major League Baseball career has been shrouded by the conspiracy surrounding his age, but nothing in regards to his achievements that include two World Series and three National League MVP titles can be taken away from him. The 6 feet 3 inches (1.91 m) tall, 240 pounds (110 kg) heavy Domincan-American, who was drafted just after one year of college baseball by the St. Louis Cardinals, is revered for his contact hitting ability, patience, and raw power when hitting. Pujols currently plays for the Los Angeles Angels as a first baseman and designated hitter. In 2018 he joined the 3000 hit club and further became a member of the very exclusive 3,000-hit and 600 home runs club, which only includes three other players in history; Willie Mays, Hank Aaron, and Alex Rodriguez. Albert Pujols was born on the 16th of January, 1980, in Santo Domingo, Dominican Republic, where he was raised by his grandmother and other extended family members. There is no information regarding his mother, however, his father, Bienvenido Pujols, was a softball pitcher. While growing up, Pujols, who had the genes to back his baseball career, practiced the game using limes for balls and a milk carton for a glove. By the time he was 16 years of age, the young athlete and his father and grandmother immigrated to the United States and settled in New York City. A few months after arriving, Pujols reportedly witnessed a shooting at a grocery store, which in addition to other reasons, prompted his family to leave the city and move to Independence, Missouri where Pujols attended Fort Osage High School. Albert Pujols’ time with his high school baseball team was marred by controversy as his body and size did not match his age, causing huge protests from opposing coaches. Regardless, Pujols was twice named an All-State athlete before graduating and earning a baseball scholarship to attend Maple Woods Community College. He went on to play only one year of college baseball before entering the 1999 Major League Baseball Draft where he was selected by the St. Louis Cardinals in the 13th round with the 402nd overall pick. After being drafted, Albert Pujols joined single-A Midwest League side, the Peoria Chiefs for the 2000 season where he played in 109 games and batted .324 with 128 hits, 32 doubles, 6 triples, 17 home runs, and 84 RBIs. That same year, Pujols played in the high-A Carolina League for the Potomac Cannons and for the Memphis Redbirds in the AAA Pacific Coast League before going on to make his major league debut on the opening day of the 2001 season. In his rookie season, Pujols put on mindblowing performances, that earned him an All-Star appearance, a Silver Slugger Award, and the Rookie of the Year award. His first year’s achievements put him in a league of his own and propelled him to a career that when all is said and done, will end up among the greatest baseball has ever seen. Albert Pujols has been one of baseball’s highest earners since he put pen to paper on a 10-year deal worth around $254 million with the Los Angeles Angels in 2011. From his contract which will run through 2021, the three-time MVP and six-time Silver Slugger Award recipient takes home an average annual salary of $24 million. According to Forbes Magazine, however, Pujols in 2018 earned $28 million ($27 million in salary and $1 million in endorsements). The extra amount was said to have been triggered by a clause in his contract. With Pujol’s huge earnings in mind, it should not come as a surprise that he is worth a whopping $170 million. Albert Pujols married his wife Deidre on the 1st of January 2000. The pair were said to have met at a Salsa Club in the late 90s and began dating almost soon after. As the story goes, Pujols lied about his age to get Deidre to go out on a date with him when they met, saying he was 21 when he was indeed only 18. She was herself a 21-year-old single mother at the time, which she revealed to him. The connection felt between the pair proved to be stronger than whatever curve ball life was throwing at them as they forged ahead to begin their fairytale story. 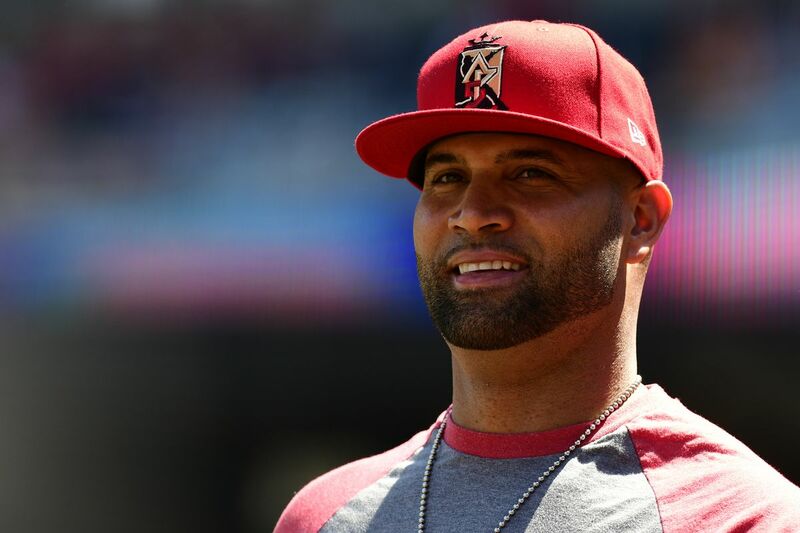 With influence from Deidre and his grandmother, Pujols became a Christian in 1998. Two years later, they wedded and went ahead to welcome four more children; Albert Jr., Sophia, Ezra, and Esther Grace, in addition to Deidre’s daughter, Isabella. Isabella was born with a genetic disorder known as Down Syndrome. 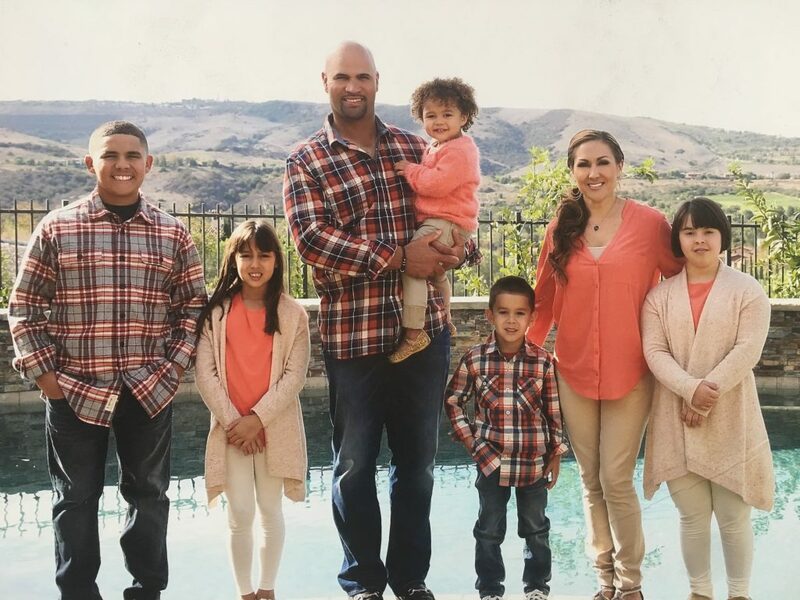 Because of this, Albert and Deidre, through their non-profit; the Pujols Family Foundation, promote awareness of the condition and work to support people diagnosed with it. They have further opened the Albert Pujols Wellness Center for Adults with Down Syndrome.